If there is one kind of slot that experienced developer IGT have a prolific track record of releasing then it is wild animal-themed slots. You only have to look at their world famous Cats slot and the Wild Wolf slot as an example of this past form. So you can understand the excitement surrounding Prowling Panther. 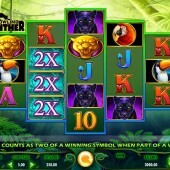 Prowling Panther is a 5 reel, 720 ways to win slot by IGT that is part of their MultiWay Xtra series. MultiWay Xtra slots allow players to hit wins that pay for the same symbol in any position on adjacent reels with a same symbol on a same reel multiplying a win. The MultiWay Xtra wins pay left to right and they are multiplied by the coin value. It should also be noted that only the highest paying MultiWay Xtra win for each symbol is paid on each spin. The symbols across the reels have a very exotic feel that will remind you of the breathtaking Untamed Bengal Tiger slot from Microgaming. The black panther, toucan, parrot, and regular 10-through-to-Ace symbols fill the reels. There is also a 2x Wild symbol located on reels 2, 3, and 4. This symbol substitutes for all symbols, except for the Scatters, to help complete winning combinations and counts as two of the winning symbol on a MultiWay Xtra win. These symbols also act as Stacked Wilds to increase the thrills and spills. The free spins bonus round is triggered when you hit the golden panther Scatter on all five reels. You will initially be awarded at least 8 free spins but depending on any other free spins-triggering winning combinations across the reels, you could potentially win up to 96 free spins. In addition to this, the golden panther Scatters remain in play during the free spins and this means that the free spins can be re-triggered up to a number of 256 free spins. 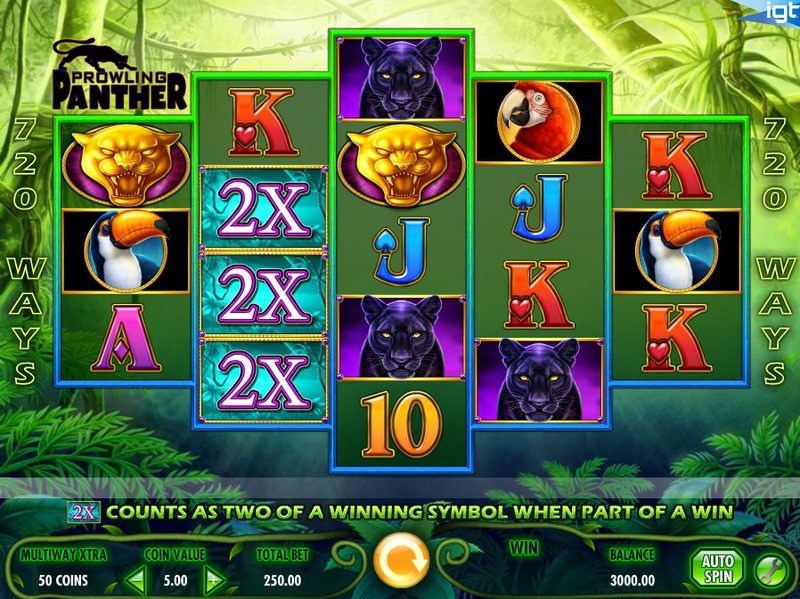 Prowling Panther is a slot that feels like a vintage IGT slot title. The inclusion of the MultiWay Xtra feature is fantastic to see and the free spins bonus round might be tricky to trigger but it is worth the wait because there's some potential huge payouts to be won. I'm still a bigger fan of the Microgaming Untamed series when it comes to wild animal-themed slots but IGT have certainly done their portfolio no harm with this addition. Players who like the MultiWay Xtra slot Siberian Storm, should instantly connect with this one.